A couple stands in the Boston Common posing for a photo with the buildings of Boston behind them. They are wearing pea-coats and jeans and the sky is gray. 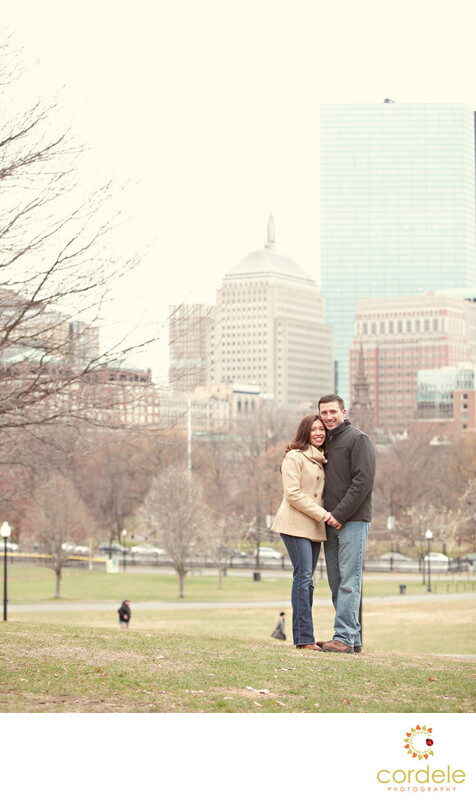 Boston Common engagement sessions are so fun. There are so many hidden nooks and crannies to go do photos in. For this photo I found a spot that would help highlight the city skyline which was important to the couple. This day was really cold, so we tried to stay out of the open field and do LOTS of cuddle pictures. Even though they had jackets on we made the photos work for us. Winter engagement photos can be hard. We were lucky there was no snow, so I will take the cold over snow for a shoot any day! Location: Boston Common Tremont St, Boston, MA 02116.